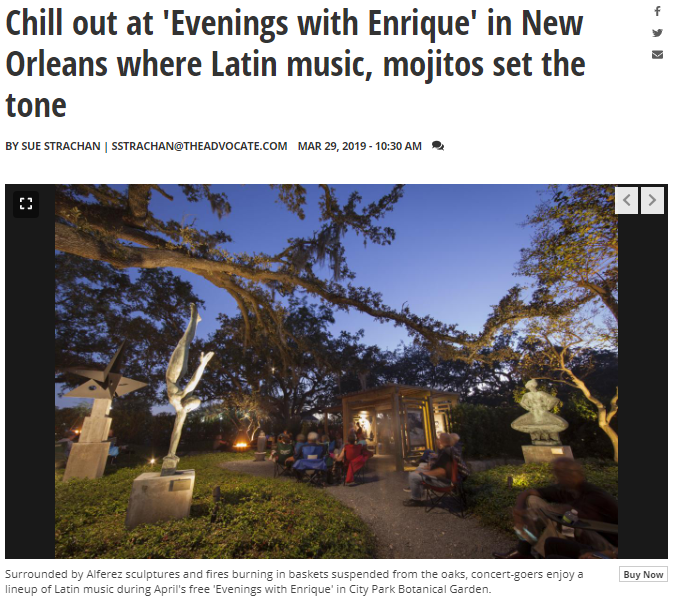 The free Latin music lineup, inspired by its setting in the Enrique Alferez Sculpture Garden in New Orleans City Park, welcomes visitors Wednesday evenings through April, said Paul Soniat, director of the City Park Botanical Garden. “The music is calming and chill,” he said. Born in Mexico in 1901, Alferez moved to the U.S. in 1920 after fighting with Mexican revolutionary Pancho Villa. Working in Texas as a photographer’s assistant, he met art teacher Lorenzo Tate, with whom he later trained in Chicago. In 1929, Alferez relocated again, this time to New Orleans, where he remained until he passed away in 1999. Alferez’s Art Deco-inspired works can be found throughout the city and United States, but locally he may be best known for his sculptures, iron gates and reliefs in City Park, which he created for the Works Projects Administration in the 1930s. In 2015, some of Alferez’s works were moved from other parts of the garden, or donated by private collectors or The Helis Foundation, to create the sculpture garden within the larger garden. In the sculpture garden, the artwork, greenery, fountains and florals create a perfect mood for concertgoers, who can also purchase mojitos and Latin food from La Cocinita food truck. Flames flicker in baskets suspended from the boughs of the garden’s ancient oaks. While this evening concert series complements the park’s Twilight Garden Concerts, on Thursday evenings, the free “Evenings with Enrique” series has its own distinct charm, allowing concertgoers to relax, sit back and listen to music, or tour the rest of the Botanical Garden.